Established by Puritans in 1638 based on its sheltered harbor, New Haven was for over two centuries the co-capital of Connecticut with Hartford. _The American Gazetteer reported in 1810, "As to pleasantness of situation and salubrity of air, New Haven is hardly exceeded by any city in America." The prominence of the "Elm City" was largely due to the presence of Yale College, which moved to New Haven from Saybrook in 1716. Before there was a lighthouse at New Haven's Five Mile Point, the spot was noted for a battle in the American Revolution, when American riflemen repelled a British attempt to land and invade New Haven. British Ensign and Assistant Adjutant Watkins was killed in the skirmish and was buried close to where the lighthouse now stands. The British later landed at Five Mile Point and burned down the house of resident Amos Morris. Morris repaired his house and it still stands, not far from Lighthouse Park. __New Haven was a flourishing port in coastal and West Indies trade. _Built in 1805 on the east side of the harbor entrance, the first New Haven Light was an octagonal 30-foot wooden tower. It was commonly called Five Mile Point Light after its distance from downtown New Haven. The first keeper was Amos Morris Jr., who sold the land for the lighthouse to the government. Morris remained keeper for only three weeks. One of the early keepers, Greenwich native Jonathan Finch, spent 16 years (from 1805 to 1821) at Five Mile Point, apparently augmenting his meager keeper’s salary by taking in guests. It isn’t known how long Keeper Finch engaged in this practice, which was generally frowned on by the authorities. A SUMMER RETREAT. Gentlemen and Ladies, who, during the summer months, wish to enjoy a delightful sea breeze, an extensive prospect, shady bowers, &c. &c. are invited to the LIGHT-HOUSE, at the south point of New-Haven harbor, where arrangements are made for their accommodation. —– Lobsters, fish, clams &c. taken directly from their natural element, and served up at a short notice, with the best trimmings —– Liquors of the first chop —– Pasture or stabling for horses. —– Gentlemen who have passed their grand climactic, may here have their mental faculties perfectly restored in three days. —– No cure, no pay. J. FINCH. _From the start, the light was considered to be too low and too dim. The light was also deemed too low and dim to be much of a help to navigation. There was some consideration given to the possibility idea of a new lighthouse offshore on Southwest Ledge, a more advantageous location, but building a lighthouse on the rocky ledge was then prohibitively expensive. Instead, $10,000 was appropriated for a new, taller tower at Five Mile Point on March 3, 1847. The new 80-foot octagonal tower was constructed by contractor Marcus Bassett of using brownstone from the East Haven quarry of Jabez Potter. The stone was brought to Five Mile Point by horse-drawn drays. The interior was lined with New Haven brick, and a circular granite stairway with 74 steps was added. A system of 12 lamps and reflectors was installed inside the cast- iron lantern, with the light 97 feet above sea level. A new two-and-one-half-story brick keeper’s house was also erected. The 12 lamps and reflectors were replaced in 1855 by a fourth-order Fresnel lens, and a fog bell was added in the 1860s. __Merritt Thompson, a native of East Haven, was keeper from 1853 to 1860. Captain Elizur Thompson, born in East Haven in 1809, became keeper in 1860. They were most likely related, but the relationship of the two Thompson's isn't clear. _As it turned out, he was the light’s last keeper, staying until 1877 except for a two-year gap from 1867 to 1869. Thompson’s wife, Elizabeth (Bradley), was on the payroll as an assistant keeper for two years, and their sons Sidney and George also served as assistants. Charles William Bradley was keeper during Thompson's absence, 1867-69. Bradley was a native of nearby East Haven and was a former grocer, teacher. and farmer. At various times he held the positions of selectman, postmaster, justice of the peace, and chairman of his town's Democratic committee. After his time at the lighthouse, he became the superintendent of the New Haven Almshouse. In this view (right) from the top of the lighthouse, the old storm signal tower is at the left. In the distance in the upper right is Southwest Shoal Light. When Southwest Ledge Light was established offshore in 1877, the old light at Five Mile Point was extinguished. Thompson went to Southwest Ledge to serve as the first keeper. After almost five years in that position, he returned to live in the old keeper’s house at Five Mile Point, flying storm signal flags for the United States Weather Bureau. Capt. Elizur Thompson . . . is eighty-one years old, but still he climbs the steps of the tower with agility to display the signals. He is a hospitable man and very popular among the professors of Yale College . . . He is an authority on matters of local history that have transpired during the past seventy years. _Among many other interesting incidents, Thompson remembered shaking General Lafayette’s hand when the French general was visiting the area in 1824, when Thompson was 15. In 1896, Five Mile Point Lighthouse was transferred to the War Department. In 1922 the land was transferred to the State of Connecticut and the buildings went to the City of New Haven, and in 1924 the City bought the entire property for $11,180. The New Haven Park Commission opened Lighthouse Point Park with the city's only public swimming beach. Lawrence "Ted" Porter, moved in as caretaker in 1943. Porter had started his career with the city of New Haven at the age of 14, lighting gas lamps on the city's streets. His stay as caretaker at Lighthouse Point Park stretched into the 1970s. A 1964 newspaper article reported that Porter had the duty of flying storm warning flags as needed from a steel tower, which still stands near the lighthouse. Ted Porter endured some memorable storms, including a 1944 hurricane that had seawater lapping at his front door. It wasn't unusual for the caretaker and his family to be stuck inside the house for two or three days after a severe snowstorm. A $67,000 renovation was completed in 1986. The interior and exterior of the tower were steam-cleaned and decades of guano was removed from the stairs. Plexiglas was installed in the lantern room and chips in the mortar were repaired. 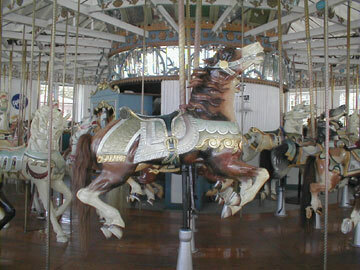 _The old lighthouse tower stands today near a restored antique carousel. _ The park grounds are open year-round but the tower is usually closed. Please note that there is an entry fee. 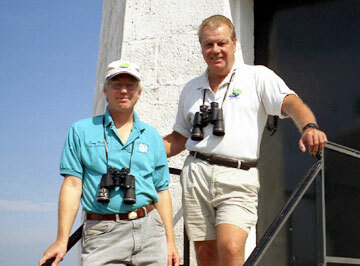 The Lighthouse Point Park Rangers have offered tours of the lighthouse on a limited basis in recent years. You can check the park's website or call the Lighthouse Point Park rangers at 203-946-8790 to see if any special events are scheduled. Right: A view from the top of the lighthouse, looking toward downtown New Haven.